November 12th 1944. Lancaster's from Nos 617 and 9 Squadron bombed the German battleship 'Admiral von Tirpitz' at anchor just off Tromso. Using Barnes Wallis designed Tallboy bombs dropped from between 12,000 to 16,000 feet they delivered several very close misses and three or more direct hits. A column of steam and smoke shot up to 300 feet and within a few minutes the massive ship began to turn turtle. The RAF and Royal Navy had had several previous 'goes' at the Tirpitz with limited success, but on this occasion the threat from this extremely powerful warship ended. The painting depicts Wing Commander J B Tait's Lancaster after his bombing run 'staying on the scene' to observe the outcome of the mission. The rest of 617 and 9 Squadron aircraft complete their runs and turn to head home to Lossiemouth. Down below at low level another Lancaster is orbiting and filming the destruction. This Lancaster came from 463 Squadron and was the last one to return home. 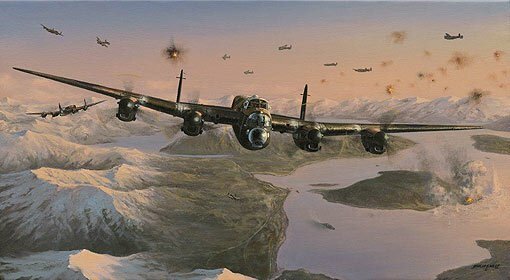 With only one Lancaster being seriously damaged all the aircraft completed the mission. Sqn. Ldr. Lawrence “Benny” Goodman (Pilot) volunteered for aircrew at 18 years of age and was called up in 1940. After basic training he went to RAF Abingdon – a Whitley O.T.U – for what he was told would be ‘straight through’ training. This did not materialise and he found himself in the role of a Ground Gunner. In 1941, a posting eventually came through to the Initial Training Wing followed by Elementary Flying School at Peterborough and an instructor’s course at Woodley, Reading; then to Clyffe Pyparde, a holding unit. A sea journey to Canada followed and Service Flying Training School on Ansons. On completion he was posted to Kingston, Ontario, to instruct Acting Leading Naval Airmen on the Royal Navy tactics of the time. e.g. jinking after take off, dive bombing etc. “However, I had to learn everything first, so I was just about one step ahead of the students! said Benny.